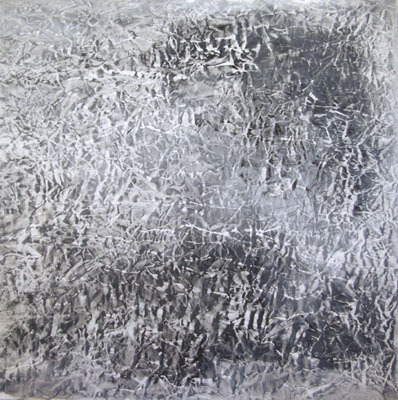 Untitled 1262–07, 2007, oil, alkyd, and wax on canvas, 50 x 50". Movement “implies a plurality of centers, a superposition of perspectives, a tangle of points of views, a coexistence of moments which essentially distort representation,” writes Gilles Deleuze in Difference and Repetition, the title of which Vicky Colombet has borrowed for this exhibition. And it is through the perceived movement of the image that each of Colombet’s works becomes uniquely affective, despite its pictorial similarity to the others. The abstract composition of Water Falls 1189–06, 2006, for instance, suggests icy water tumbling over sharp rocks; yet, as the title implies, it is less its resemblance to a waterfall than its ability to convey the actual action of water falling that makes the image so compelling, requiring both a close and a distanced vantage point. To create her oil, alkyd, and wax paintings, which compose the bulk of this show, Colombet manipulates the canvas in various ways to form numerous crevices, folds, and jagged topographies that she then applies paint to. The result is, as the gallery notes, a blend of Minimalism and Land art, and the images suggest, in their blues and grays, rugged, at times Arctic, landscapes—as in Untitled 1260–07, 2007—as well as strangely intimate anatomical portraits. (The distinct fine lines in the gray fields in Untitled 1262–07, 2007, for example, look like intricate networks of tiny nerves and capillaries.) Four smaller-scale black-and-white works from her series “Dialogues,” 2005–, comprise distorted images, which look almost like details of the larger works, composed of charcoal, pigment, and mineral spirit (a type of paint thinner) on vellum, placed above spare ink-on-paper drawings. Not directly relational, the juxtaposition is intended to enable a conversation between the works. Of the type held throughout the show, the conversation interrogates the subtle yet profound difference within each repetition.